37603 + 37667 6V73 0433 Crewe Coal Sidings (Drs) - Berkeley C.E.G.B. 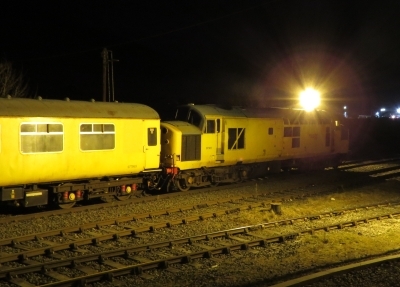 97304 1Q14 0933 Derby R.T.C. 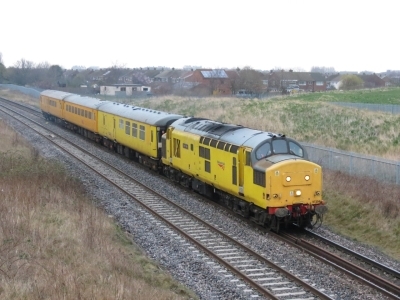 (Network Rail) - Grantham - York - Peterborough L.I.P. 0M60 1325 Seaton-o-t British Energy - Sellafield B.N.F. 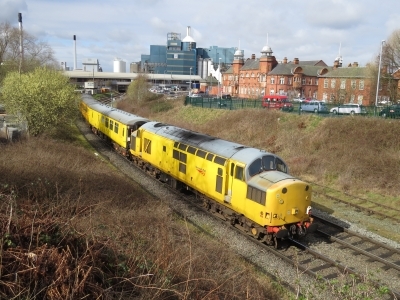 37610 tnt 37425 3Z03 1232 Derby R.T.C. (Network Rail) - Hither Green Down Recp. 37611 + 37419 6C53 0630 Crewe Coal Sidings (Drs) - Sellafield B.N.F. 37405 + 37667 6V73 0433 Crewe Coal Sidings (Drs) - Berkeley C.E.G.B. 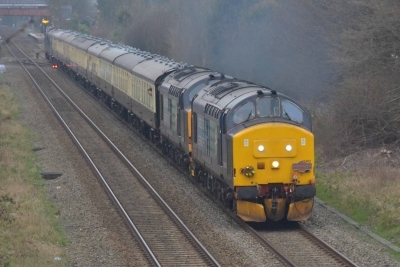 37602 tnt 37688 6C51 1258 Sellafield B.N.F. - Heysham Harbour P.S. 6C52 1605 Heysham Harbour P.S. - Sellafield B.N.F. 97304 1Q14 0940 Heaton T&R.S.M.D. - North Blyth - Lynemouth Dbs - North Blyth - Newsham L.C. - Lynemouth Dbs - Newcastle - Seaton-o-t British Energy - Hartlepool - Tees N.Y.
37682 + 37667 6C53 0630 Crewe Coal Sidings (Drs) - Sellafield B.N.F. 37419 + 37611 6L68 0314 Willesden Brent Drs - Southminster C.E.G.B. 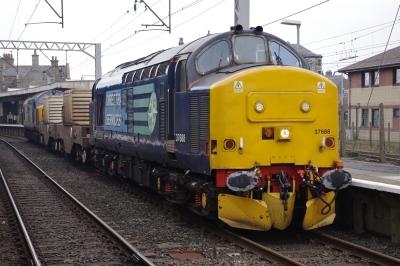 37425 + 66432 DIT 0S82 0830 Carlisle Kingmoor Sdg(Drs) - Coatbridge F.L.T. 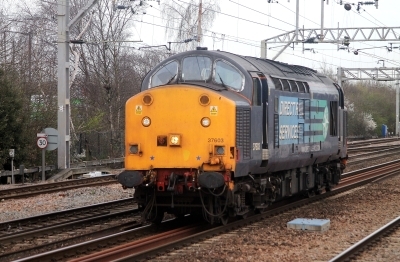 37601 tnt 37608 1Q74 0855 Cambridge C.S.D. 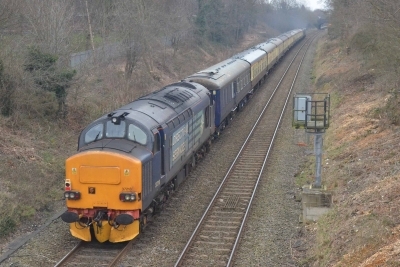 - Ely Up Goods Loop - Stowmarket D.G.L. - Ely - Liverpool St - Camden Signal 2102 - Stratford - East Ham E.M.U.D. 6M22 1217 Hunterston Ll Drs - Sellafield B.N.F. 37682 + 37667 6V73 0433 Crewe Coal Sidings (Drs) - Berkeley C.E.G.B. 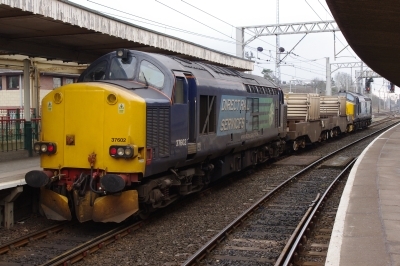 37601 tnt 37608 1Q74 0936 Cambridge C.S.D. - Great Chesterford Up Gdslp - Norwich - Ely - Middleton Towers - Cambridge C.S.D. 37607 + 37409 6V73 0433 Crewe Coal Sidings (Drs) - Berkeley C.E.G.B. 37419 + 37611 6C53 0630 Crewe Coal Sidings (Drs) - Sellafield B.N.F. 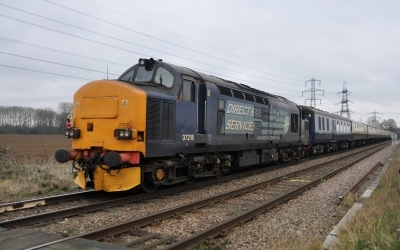 37601 + 37608 1Q75 1037 Derby R.T.C. (Network Rail) - Cambridge T.&R.S.M.D. 37603 0Z37 1230 Hither Green Down Recp. - Dollands Moor L.H.S. 37604 3Q42 0033 Millerhill S.S. - Carstairs - Haymarket - Edinburgh - Millerhill S.S.
37611 + 37419 6L70 0059 Crewe Coal Sidings (Drs) - Sizewell C.E.G.B. 66302 + 37419 DIT 0K27 1600 Carlisle Kingmoor Sdg(Drs) - Crewe Bas Hall S.S.M. 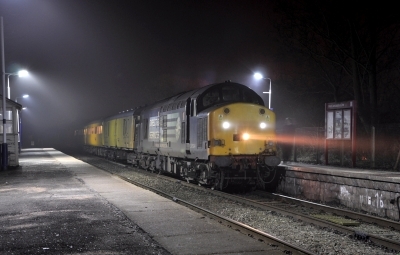 37602 tnt 37606 6C51 1258 Sellafield B.N.F. - Heysham Harbour P.S. 37603 0Z31 0942 East Ham E.M.U.D. - Hither Green Down Recp. 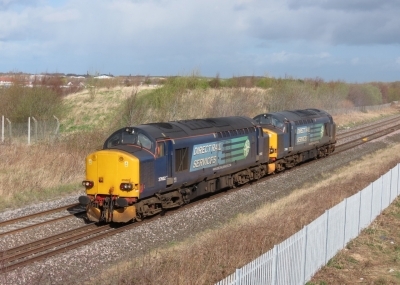 37667 + 37682 + 37605 + 20312 6C53 0630 Crewe Coal Sidings (Drs) - Sellafield B.N.F. 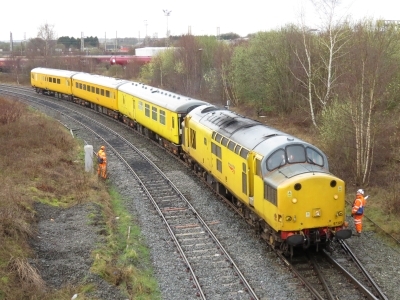 37603 0Z31 0911 Derby R.T.C. (Network Rail) - East Ham E.M.U.D. 37610 + 37611 6L70 0059 Crewe Coal Sidings (Drs) - Sizewell C.E.G.B. 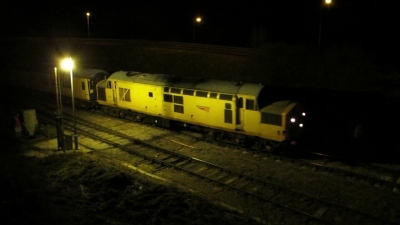 97301 1Q14 1024 Derby R.T.C. 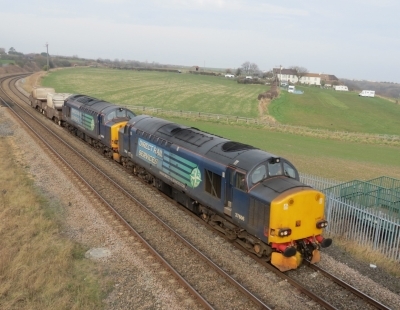 (Network Rail) - Scunthorpe Roxby Gullet - Humber Road Jn - Doncaster L.I.P. 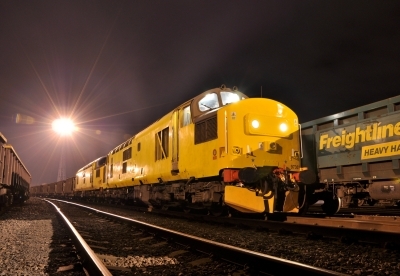 97301 1Q14 0901 Longsight T.M.D. (D) - Oakleigh Sidings - Latchford Sdgs - Edge Hill Down Wapping - Regents Road L.C. 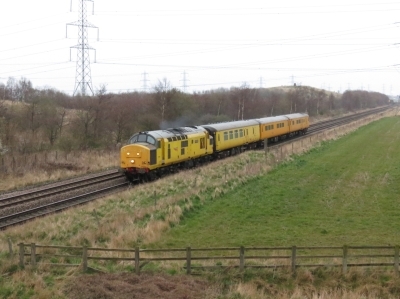 37607 tnt 37609 3Z03 1014 Derby R.T.C. (Network Rail) - Hither Green Down Recp. 1Q13 1948 Hither Green Down Recp. - Battersea Loop - Orpington - London Bridge - Streatham Hill Up Siding - Orpington - Hither Green Down Recp. 37425 + 37612 6C53 0630 Crewe Coal Sidings (Drs) - Sellafield B.N.F. 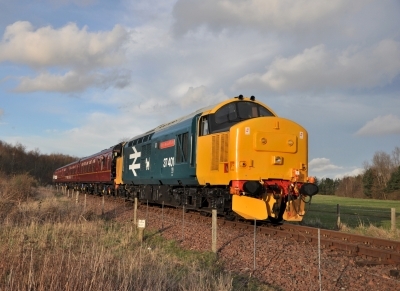 37667 tnt 37605 1Q66 1640 Thurso - Wick - Inverness T.M.D. 37425 + 37612 6L70 0059 Crewe Coal Sidings (Drs) - Sizewell C.E.G.B. 6M60 1325 Seaton-o-t British Energy - Sellafield B.N.F. 57003 + 57007 & 37607 DIT 0K05 1246 Carlisle N.Y. - Crewe Bas Hall S.S.M. 37610 + 37611 6C53 0630 Crewe Coal Sidings (Drs) - Sellafield B.N.F. 6Z97 1928 Toton North Yard - Crewe Bas Hall S.S.M. 37601 + 20304 6C53 0630 Crewe Coal Sidings (Drs) - Sellafield B.N.F. 37603 3Q40 2017 Hither Green Down Recp. - London Bridge - Paddock Wood - London Charing Cross - Dartford - Hither Green Down Recp. 37601 + 20304 6L70 0059 Crewe Coal Sidings (Drs) - Sizewell C.E.G.B. 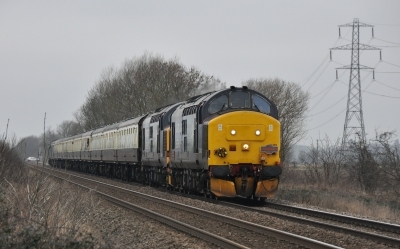 37603 3Z03 1014 Derby R.T.C. (Network Rail) - Hither Green Down Recp. 37605 tnt 37667 1Q13 0637 Derby R.T.C. (Network Rail) - Hither Green Down Recp. 37425 + 37602 6C53 0630 Crewe Coal Sidings (Drs) - Sellafield B.N.F. 37218 + 37409 6K27 1600 Carlisle N.Y. - Crewe Bas Hall S.S.M. 37612 + 37425 6L70 0059 Crewe Coal Sidings (Drs) - Sizewell C.E.G.B. 1Z36 0616 Crewe - Dereham U.K.F. Between Ely Signal Wymondham - Dereham U.K.F. 37606 + 37602 6C53 0630 Crewe Coal Sidings (Drs) - Sellafield B.N.F. 37612 + 37605 6C53 0630 Crewe Coal Sidings (Drs) - Sellafield B.N.F. 37682 + 37259 6L70 0059 Crewe Coal Sidings (Drs) - Sizewell C.E.G.B. 37402 + 37409 6C53 0630 Crewe Coal Sidings (Drs) - Sellafield B.N.F. 37603 tnt 37608 1Q74 1102 East Ham E.M.U.D. - Fenchurch St - Shoeburyness - Fenchurch St - Shoeburyness C.S.D. - East Ham E.M.U.D. 37606 + 37602 6K05 1246 Carlisle N.Y. - Crewe Bas Hall S.S.M. 6C28 1520 Shap Summit Quarry - Carlisle N.Y.
37603 tnt 37608 1Q74 0951 East Ham E.M.U.D. - Barking Upney Junction - Liverpool St - Stansted DGL - Liverpool St - Southend Vic - East Ham E.M.U.D. 37603 tnt 37608 1Q74 0859 Hither Green Down Recp. - Purfleet Long Siding - Willesden Brent Sidings - Ferme Park Recp - Upper Holloway - East Ham E.M.U.D. 37607 + 37602 6C53 0630 Crewe Coal Sidings (Drs) - Sellafield B.N.F. 37610 tnt 37611 1Q13 1620 Alexandra Dock Jn. T.C. - Splott Jn - Pengam Sidings - Tower Colliery Fliner Hh - Newport - Alexandra Dock Jn. T.C. 37602 + 37607 6L70 0059 Crewe Coal Sidings (Drs) - Sizewell C.E.G.B. 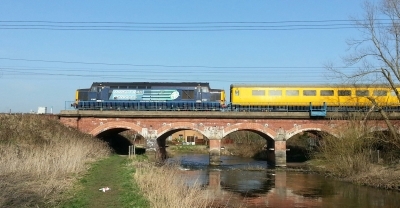 37610 tnt 37611 1Q13 0934 Derby R.T.C. 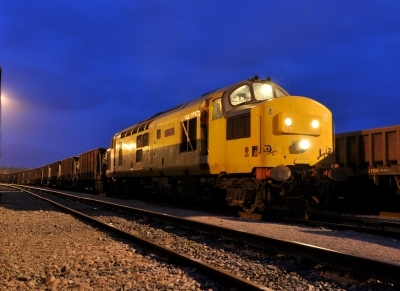 (Network Rail) - Crewe - Alexandra Dock Jn. T.C. 37608 tnt 37603 1Q74 0916 Derby R.T.C. (Network Rail) - Hither Green Down Recp.